Brian McGreevy was raised in a two-minister home deep in the Pennsylvania Rust Belt where he dropped out of high school in the ninth grade over “creative differences.” Eventually he found his way to Austin, Texas where he was a James Michener Fellow in fiction and screenwriting at the University of Texas. His primary thesis went on to become the novel Hemlock Grove (FSG, 2012), while his secondary thesis appeared on the Hollywood Black List of best not-yet-produced screenplays in 2007. While revising Hemlock Grove McGreevy worked as a screenwriter-for-hire within the studio system, in which period only one project he worked on went into production, with no actual words he contributed surviving. Frustrated with the film industry and sensing the migration of audiences to streaming services, McGreevy sold his forthcoming manuscript to Netflix in 2011, which was adapted into an original series of the same name that ran for three seasons. McGreevy went on to partner with former Michener classmate Philipp Meyer to turn Meyer’s Pulitzer short-listed novel The Son into a series for AMC. In 2015 he released a digital novella called Desire set before the events of Hemlock Grove. 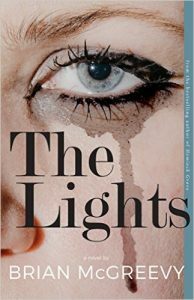 His second novel, The Lights (Rarebird, 2017) is an examination of love and art inspired by his Austin experience.